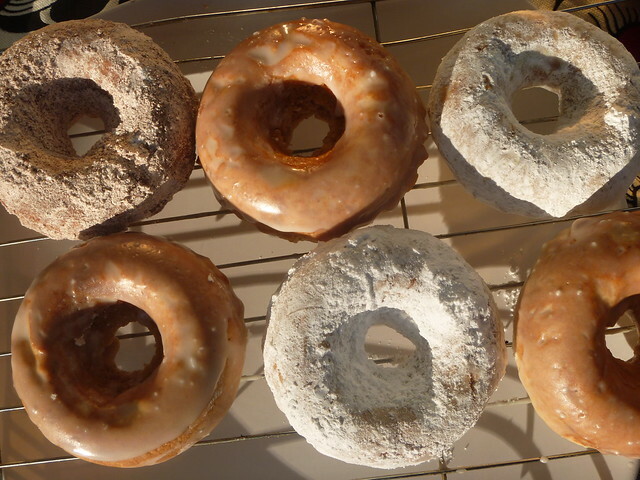 Two things always irked me about making homemade doughnuts. The first was how huge so many of the recipes were out there... we;re talking 5 to 7 cups of flour and 3 dozen doughnuts at least. The other was how difficult it was to get those perfectly round O's. After getting the recipe down and receiving a lot of thumb's up and requests for more, the next thing to tackle was how hard it was to prevent everything from going all pear shaped. Then I watched someone use a doughnut pan and it all became clear. Doughnuts are actually really easy to make at home once you have one of these. Plus I wasn't really keen on frying anyway. As seen with these fries here and here a lot of things taste just as good baked. Doughnuts are no exception, especially the risen Krispy Kreme type which we'll get into later. 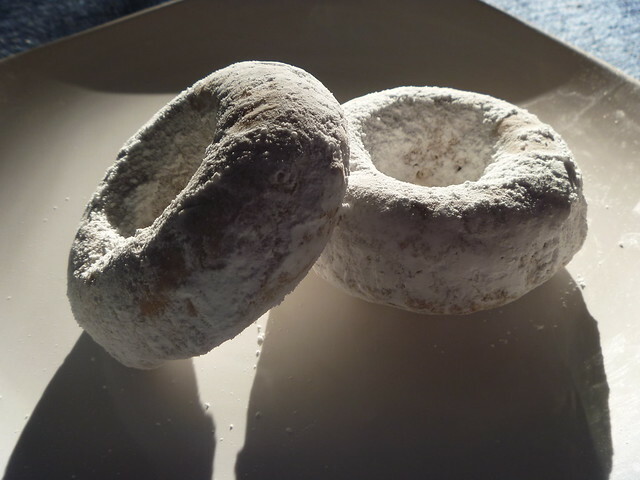 For now we'll we making these cake style doughnuts reminiscent of Entenmann's. The only thing I've found to be the case with baked cake doughnuts is they need to sit a good number of hours after coming out of the oven. Preferably overnight or 24 hours even. This allows the crust to soften up and when it does, it has that classic moist yet crumbly texture that's delicious under powdered sugar or glaze. It turns out the key to that yellow color comes from tumeric. Not only is it really good for you but it will not change the flavor of the doughnuts. While this old style recipe was created for frying I prefer to bake these using my handy doughnut pan and a bit of coconut oil brushed over the dough. 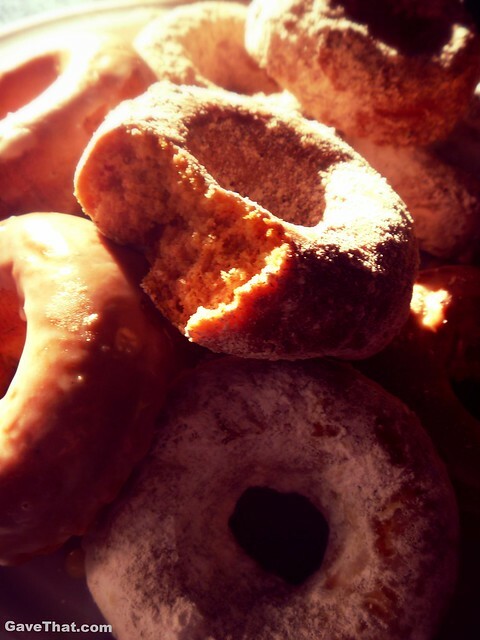 If baking, allow doughnuts to sit covered for a few hours so that the crust softens. Preheat oven to 370.Scald buttermilk for 20 seconds in the microwave and set aside to fully cool. In a mixer beat eggs until yellow and frothy. About 5 minutes.Add starch to cooled buttermilk and stir until fully dissolved.Add rest of ingredients into egg mixture and beat using a dough hook until a dough ball forms. 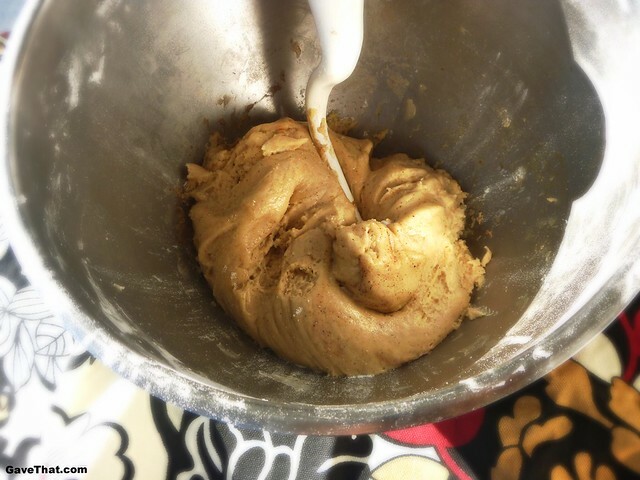 Dough may be sticky, if so roll on a well flowered surface and sprinkle rolling pin or hands with flour.Roll or pat dough to about 1.2 inch thickness and use a round cookie cutter or ring to cut out 12 doughnuts. 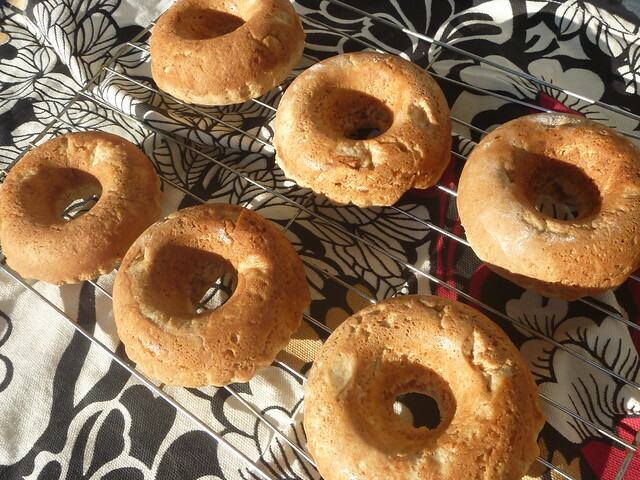 Place dough rings in doughnut pan which has been oiled with coconut oil and brush top of doughnut dough with oil.Bake for 12 minutes or until golden brown. Do not over bake. 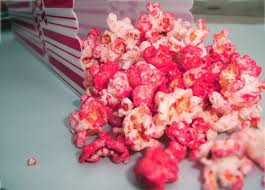 Cool on wire rack and then allow to sit in an air tight container at least 5 hours to allow the crust to soften.Brush with melted butter or coconut oil and shake in a bag of powdered sugar to coat or dip in glaze. 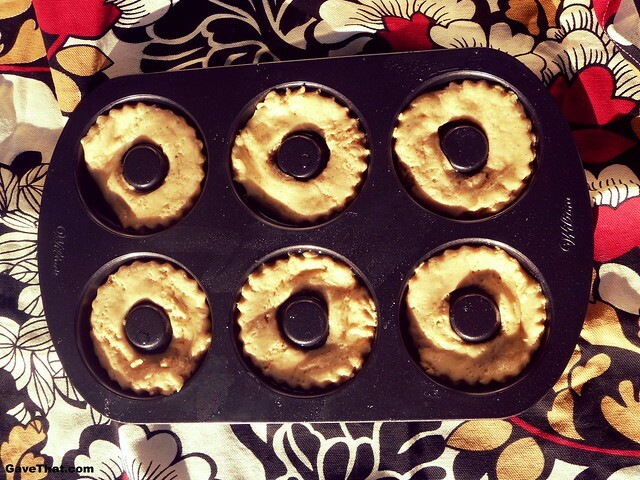 Tip: Add in 1/2 teaspoon of ginger to turn these doughnuts into gingerbread flavored and glaze with maple frosting. Getting ready to go into the oven. Here they are freshly out of the oven cooling down on wire racks. Whisk all ingredients together well and dip fully cooled doughnuts into glaze. Allow excess to drip off ob wire rack or place in freezer for a few minutes to quickly harden glaze. 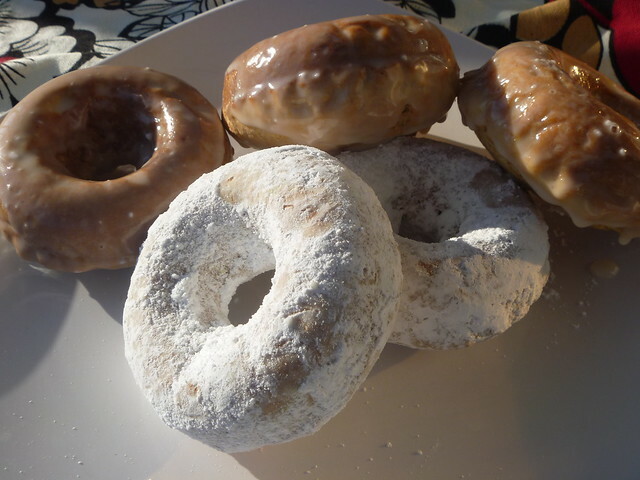 Glazed doughnuts can then be dusted with chopped nuts, pieces of breakfast cereal or shredded coconut.